In a battle of Top-4 teams, Cornell University beat Mercyhurst 3-0 at the Mercyhurst Ice Center to end the Lakers' four-game winning streak. In just her second season, Cornell defenseman Laura Fortino has seen her share of the top line of the Mercyhurst women's hockey team. Fortino collected two assists while the rest of the nation's top defensive unit frustrated and shut out Mercyhurst, who came into the contest as the best scoring team in the country, for the first time on home ice since 1999 as the No.2-ranked Big Red beat the Lakers 3-0 Tuesday evening in front of 968 at the Mercyhurst Ice Center. "We did a heck of a job in our (defensive) zone," said Fortino, who was on the ice almost every time against Meghan Agosta, the top scorer for the Lakers. "Blocking shots was key for us. Everything was great in our own zone." Mercyhurst, who handed the Big Red their only loss this season in a 4-3 road overtime victory Nov. 2, struggled to find any offensive flow throughout the game against a defense that allows just .83 goals against. "Today (Cornell) was the better team," Mercyhurst coach Mike Sisti said. "They played great in all aspects of the game. They deserved to win." Despite being outshot 12-8 in the first period, the Lakers generated the best scoring chance in the final seconds as Agosta corralled a loose puck with just five seconds to play. She was able to get create space and let a shot loose towards freshman goalie Lauren Slebodnick, but the backup net minder turned the shot aside to end the evenly played period. Little did the Lakers know that would be their only chance to score until the third period. The Big Red suffocated Mercyhurst in the second period, as the majority of the period was played right in front of Laker goalie Hillary Pattenden. 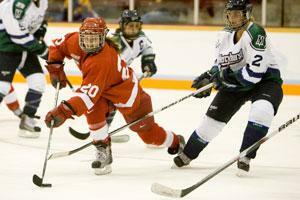 "We just keep focusing on going hard and frustrating (Mercyhurst) more," Fortino said. As the Cornell defense collapsed on every forward who crossed the red line, the offense maintained pressure before Karlee Overguard took advantage of a failed clearing attempt and ripped a slap shot over the glove of Pattenden for just her fourth goal of the season to claim a 1-0 advantage. When the horn sounded in to signify the end of the second period, Mercyhurst produced just three shots and had no answer for a stingy defensive unit that made the No. 4-ranked team in the country earn every inch of ice. Sisti tried everything in the second, from jumbling lines, double-shifting Agosta and putting Bailey Bram on the first line. Nothing seemed to work. "We forced a lot of passes and turned the puck over," Sisti said. "Against (Cornell), you have to try and possess the puck. They just played better." The momentum was in favor of Cornell, but Agosta was an inch away in the early seconds of the third from tying the game and swinging the energy back to her team. The Olympic gold medalist took a puck in the opening 15 seconds and beat Slebodnick clean over the glove. Her shot hit the right post and ricocheted to the corner instead of the back of the net. "It's pretty frustrating, but that's hockey," Agosta said. "It's unfortunate but that's the way hockey is sometimes. You just have to keep battling." The quick chance appeared to put life in Cornell, not Mercyhurst, as Overguard would score her second of the game 11 minutes, 8 seconds of the final frame to deflate Mercyhurst, whose a four-game winning streak came to an end. Overguard used a defenseman to screen Pattenden, as the puck fluttered over the glove for the back-breaking goal. Despite registering 13 shots and appearing to get an idea on how to get around the Cornell defense, Mercyhurst couldn't beat Slebodnick, who was making just her sixth start of the season. Slebodnick was challenged at times in the third, but never lost her focus. "You're never really sure with a freshman when you first put them in there," Cornell coach Doug Derraugh said. "We knew tonight was going to be a big challenge for her and she rose to the occasion." Catherin White, who scored the game-winning goal against the Lakers in Cornell's 2-1 overtime victory in the 2010 NCAA Frozen Four Semifinals, put the finishing touches on the win as she pushed a loose puck into a vacant net for the final goal of the game. With the offensive barrage that fueled Mercyhurst's winning streak – 29 goals in four games – Cornell put a pressure on the Lakers that they have rarely seen this season. "I don't think we were strong on the puck," Sisti said. "We were a little anxious and forced the puck a bit." With the loss, Mercyhurst could fall out of the Top-5 in the NCAA Division I poll, while Cornell extended its winning streak to 13 games. The rest of the Lakers' schedule consists of conference games, meaning the only chance it will get to play the Big Red again will be in the Frozen Four, which is March 18-20 at the Tullio Arena. "We get back to work starting tomorrow," Agosta said. "We can't dwell on the loss. We're just going to continue getting better as a hockey team."